This week’s interviewee is a broadcaster by the name of Victor Anderson. Victor is the current play by play voice of Rollins College and can be followed on twitter @RedAndersonPBP. I’ve been broadcasting on-air since I was 18 years old. I started at the University of Central Florida my freshman year working volleyball and hosting my own radio show. After I was suspended for a year, I came back and worked mainly with softball for three years before I graduated in 2007. After taking time off to get settled in, I went to broadcasting school so I can sharpen up my skills. Rollins College in Winter Park called me late in 2010 to do some broadcasting for their basketball team. Next thing you know, I’m broadcasting softball and volleyball. It’s been a fun ride for me and it’s just getting started. It started really young for me. My family said I “read” the sports page when I was three at my grandmother’s house. It kinda really began when I would read out the scores when I got a little older. I would always do the sports reports when I was in school growing up. It wasn’t until I was done playing high school football and didn’t get offered a scholarship when I realized this was my calling. I usually apply a 2:1 ratio for my broadcasts. For every one hour I work on Rollins, I spend two hours getting information on my opponent. Since I already have so much information and data on the team I work for, I feel it’s important to have as much knowledge of your opponent as possible. It’s especially vital when they don’t bring a radio crew and you’re the only voice they hear. They (the opposing team) will respect you a lot more if you know them just as well as you know your home town team. Right now, I am currently the color commentator for Rollins College Women’s Basketball. I’m set to start my third season as the play-by-play voice of Rollins softball beginning on February 20th. I’m also play-by-play for their volleyball team as well. Being an African-American, I look up to guys like Stuart Scott, Greg Gumble, and Gus Johnson in terms of their passion and love for the sport and profession. In terms of play-by-play, I try to take elements of Vin Scully, Red Barber, and Gus Johnson along with my personality to create my own unique, yet presentable style. Vin is the standard when it comes to presenting and developing a story. He makes each game it’s own novel. Red Barber is someone who talked to you as a friend while still giving you the story of what was going on. I acutally call my spot overlooking the field at our softball complex “The Catbird Seat” like Barber did while he broadcasted games for the Dodgers. Gus Johnson brings an excitement and genuineness to the sport that I respect. When I’m not broadcasting myself, I look forward to him calling games because of his energy and passion. It was 2005 and I was a student broadcaster at the University of Central Florida (UCF). I was a part of their broadcasting team for softball that season. We were playing in our conference semifinals against Florida Atlantic. Keep in mind beforehand, the two games we won during the tournament, I did PBP and my good friend Matt was the commentator. Before the game started, I was thinking that Matt would take over PBP and I would switch into my commentating role. Right before we went on the air, he looked at me and said “You took us this far, why not get us to the championship”. It’s kinda like baseball players or teams when they start winning, they keep doing the same thing. In our case, the two games we won in the conference tournament, I was PBP and he thought if it ain’t broke, don’t fix it. We’re tied at 2 in the bottom of the ninth. The bases were loaded and we’re batting. My friend actually begged on air for the player Brittani Lindheim to get a base-hit. Sure enough, first pitch, she hits a hard liner into left field that drops in and we win 3-2. After I say what happened, he hugs me and says on-air “Thank You Victor! !” I was buzzing for about three minutes realizing we knocked out our biggest rival on their home field. To make a long story short, we won two more games the next day and won the conference title. What a day that was!! One of my favorite broadcasts I’ve done happened last May in Valdosta, GA. We were playing the University of Alabama-Huntsville in an elimination game during the South Regional tournament. That was game that had almost EVERYTHING. I got to call a triple play (1st in school history), a record-breaking home run, a game-saving catch at the wall, and a Rollins College victory. However, the craziest moment happened during the second inning. One of our players laid down a bunt down the third base line and their third baseman went on her knees to try to blow the ball in foul ground. I didn’t make that up, she tried to blow the ball foul. All of us in the press box were cracking up about what we just saw. I should have realized at that time the play we just saw was a sign of what was to come. In closing, I want to say how blessed I’ve been to be a part of this great profession. Some young broadcasters think that they are God’s gift to the profression and have an attitude that reflect that (that young freshman from Seton Hall I’ve read about on STAA comes to mind). We all have to understand how grateful we need to be to have this platform. I hope that you’ve been enjoying the great interviews we’ve been able to get on the site. There will be more to come soon in the future but if you need something to read in the meantime please head on over to http://www.michaelhirn.com and let us know what you think. The site features audio, video and game recaps from Ohio based broadcaster Michael Hirn who was recently featured as one of Sports Networkers ones to watch in 2013. Welcome to another interview here on PBP Stories and thank you so much for reading the blog. If there’s someone you’d like to see interviewed please tweet me @michaelhirnpbp and I’ll see if I can get them on for an interview. 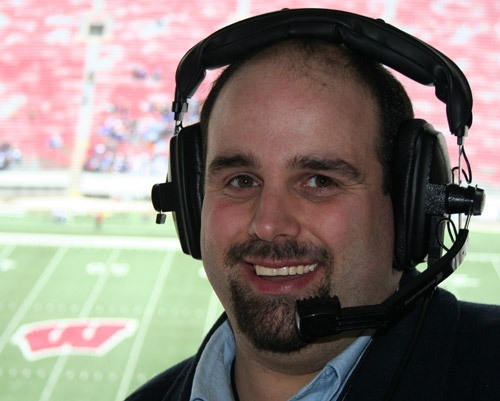 Today I am thrilled to bring to you an interview with someone I have an immense amount of respect for, and a guy who has taught me a lot in broadcasting and a man I’m luck to call a friend in Wisconsin based broadcaster Don Wadewitz. I started out in high school working afternoons at WHKQ in Racine, Wis. They had just gone to an automated system and needed someone to monitor the system from about 4 p.m. to 8 p.m. and some on weekends. It was an easy listening station so it was easy to get homework done. I did a bunch of odd jobs around the station too, including mowing the lawn and serving as a “security guard” for a money game they did for remotes. Then, after I switched from print journalism to broadcast journalism at Marquette University in Milwaukee, I started hosting a local music radio show called the Wisconsin Jukebox Radio Show. I got into local music thanks to my supervisor at my student job who was a member of The Gufs, who eventually got signed by Atlantic Records. I was the first radio show to have a website…I even had a website before our station started one. I had bands from around the state come in studio for an interview and then they’d play live music on my show. For our station, this was really cutting edge stuff and I was honored to be the first recipient of the Don & Kay McNeill Award for Cretive Efforts in Student Broadcasting. Danny Pudi, star of the NBC show Community, received the Chris Farley Scholarship at the same awards ceremony. We see who’s career took off more thus far! I did very little sports broadcasting while at Marquette but hooked up with the Racine Raiders, an adult amateur football team from my hometown, after graduation. They had just lost their broadcaster of several decades and were looking for a backup for the new two-man team. After filling in in 2002, they added a sideline reporter role that I would do when all three members of the broadcast team were available for a game. I took over the main broadcast duties during the 2011 season, becoming just the third regular broadcaster for the team in 50 years. The Raiders gig led to opportunities to do high school sports on WRJN, the sister station of WHKQ (now WEZY) where I got my start in the broadcasting business. The connections I’ve made through adult amateur football then led to a position as the voice of a now defunct professional indoor team and my current position broadcasting high school and college sports in the Whitewater, Wis. area. My dad has a letter I sent him when I was about ten years old that says, “Hold on to this card because it’s going to be worth something one day when I’m on Monday Night Football” or something close to that. I used to read the newspaper to my grandparents at an even younger age so, while I didn’t KNOW it, I’ve known I wanted to do this for most of my life. So, to balance one passion, my wife, and another passion, my sports broadcasting, I probably spend about four to six hours prepping for each game, a little under the three hours I got elbowed about. Enberg also said his first radio job paid him $1 an hour. I recently figured out what I get paid for most of my broadcasts. When you figure in my travel to my full-time job (an hour-plus), the parking in downtown Madison, the minimum 30 minute drive to a broadcast and the hour or so drive home from a broadcast, I net about $.37 an hour on the conservative end. Enberg had it good. I currently broadcast football (high school and adult amateur), basketball (high school and college), baseball and softball. I’ve also done a little lacrosse, which is by far the most difficult sport I’ve ever done. I look up to anyone who is trying their best to make it in this crazy profession. Everyone in this business has something they can teach me. I wouldn’t say I emulate anyone but I think you’ll notice a little bit of Matt Lepay (Wisconsin Badgers) and Wayne Larivee (Green Bay Packers) in my football calls and Ted Davis (Milwaukee Bucks) in my basketball calls. Still, I have my own style and I cherry-pick good things I hear people doing, regardless of what level they’re at currently. What Was Your Most Challenging Assignment? A friend was the head coach of a local college lacrosse team and they wanted to try broadcasting their games online. He asked me if I could help them get online broadcasts going and do a couple just as a trial. I never turn down an opportunity so I said I’d be glad to. Then he hit me with the news. The next game was just a few days away. I barely knew what lacrosse was at the time so I started looking online for as much information as I could find. I picked his brain, I spent hours on the Internet and, lucky for me, ESPN was doing wall-to-wall lacrosse all weekend so I got a lot of opportunities to listen to a lacrosse broadcast, even if it was a television broadcast. Luckily, he teamed me up with a guy who ended up being a great commentator and the broadcast went well. The Racine Raiders made a bowl game and the game was played in the Metrodome in Minneapolis. Needless to say, we were ecstatic to have a chance to broadcast a game from a current NFL stadium (all of the Raiders home broadcasts are from a former NFL stadium! ), even if it’s not the most modern facility. At the time, we were still using a large bag, analog cellphone. This was right as the digital conversion was starting to take place. Little did we know, the Twin Cities area had just gone all digital. To get analog service, you had to pay extra, basically like a roaming charge. We call in to the radio station and it asks for credit card information. We figured we’d have to do this once and then we’d submit the credit card bill noting the charge and get reimbursed. We couldn’t have been more wrong. Basically, every 30 minutes or so, we had to hang up, dial in again and enter the credit card info. Well, after doing this a couple of time on a card, the credit card company marked the card as possibly being used frauduently. We entered another card number. After the second time doing this, it got marked and was unusable. We ended up going through about eight credit cards and were actually out of cards to use and having to ask other staff members to use their credit cards just to keep the game on the air. When all the dust settled, we got the game broadcast without losing much of the action as we were dialing in. When we figured out all of the bills on the credit cards, we paid nearly $300 to put that broadcast on the air. We lost a little money on that one. I’ve been surprised by how willing people are to help you out in this business. For how cut throat it can appear and is, it’s refreshing to know that people are looking out for one another and generally happy for someone that is able to make it to the top through hard work and perseverance. There’s a lot of “blood, sweat and tears” in this business and it’s easy to see the cup as half empty rather than half full. It’s important to surround yourself with other peers in the industry that know when you need a kick-in-the-rear or a pick me up. It’s also good to surround yourself with others in the industry who are going to challenge you. I get motivated when I read friend’s social media postings and they’ve got a gig that night and I don’t. At that moment, I typically ask myself, “What are you going to do so that doesn’t happen tomorrow?” Then I go out and do something, anything, that is going to help me achieve more, even if it’s just listening to my latest broadcast and identifying where I can get better or sending an email to a contact just to touch base. As these interviews have been viewed more and have gone on I’ve gotten offers from some amazing people that I respect a ton(both the people interviewed already and some that are coming up here in the future) to do these, and here is another one I am so grateful to be able to share with you in legendary broadcaster Phil Giubileo. Phil for those of you who don’t know is a legendary voice from New York who came out of Fordham and is currently the play by play voice of the AHL affiliate of the NY Islanders, the Bridgeport Sound Tigers. Phil, How long have you been in broadcasting? A long time! I started working professionally in 1995 after graduating from Fordham University, where I worked at WFUV during my time in school, including two years as the station’s Sports Director. My very first paid broadcasting assignment was the 1995 Little League East Regional, where I worked for a syndicator called ISI Sports and called the games for three stations, and earned a whopping $250 and hotel room for my time. I didn’t realize that I wanted to be a play-by-play announcer until I actually started doing it at WFUV. I did go to Fordham mainly to work at the radio station, as I used to call the weekly sports show, One-on-One, which is (still) New York’s longest running sports call-in show. I was a regular caller during most of my time in high school, and it gave me the itch to want to work in broadcasting. At the time, 24-hour sports talk was very much still a new concept, as WFAN was only a couple of years old at the time. However, once I was working at WFUV, I had the chance to meet Marty Glickman, who coached us in play-by-play. I was hooked immediately once I actually started calling demo broadcasts early in my sophomore year in football and basketball. I attempt to be fairly efficient in how I prepare for my broadcasts, and over a long hockey season, it does get easier over time. Typically I spend a couple of hours preparing for my next broadcast, which isn’t always easy or convenient when you have three games in three nights. Fortunately in my situation I see the same teams, and I know the league very well, so it doesn’t take me as much time for instance, when the Bridgeport Sound Tigers are playing the Connecticut Whale for the 6th time (as they are tonight 2/1/13), as opposed to when they played back on October 12th, which was the season opener. My primary sport at this point is hockey. 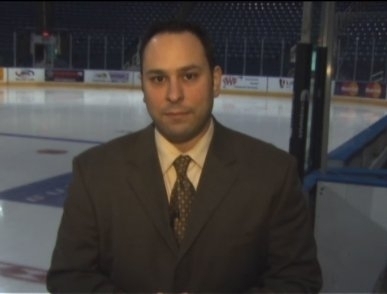 I’m in my 7th season of broadcasting for the Bridgeport Sound Tigers in the AHL. I also do a marathon day of broadcasting women’s basketball once a year for the Big East, as I am the play-by-play voice of the Women’s Big East Tournament opening round, which is exclusively covered on BigEast.tv (i.e., the only round that is not on broadcast television). I’ll be handling that task once again in March, but unlike past seasons where I’ve had to prepare to call four opening round games; there are only three this season. I was a complete NBA junkie as a kid (not so much anymore). I looked up to Marv Albert and Mike Breen as far as basketball announcers go. I thought when Breen was calling the Knicks on radio that he was the best in the business at the time. As much as I love baseball, I didn’t really have any announcers that I looked up to, but I enjoyed listening to games on radio as well. It probably wasn’t until I was in college when I started listening to broadcasters differently then when I was a kid, and really started to appreciate the work of a number of top guys. In regards to baseball, there’s nobody better than Vin Scully, but I also liked the work of Jack Buck. I also thought Buck was underrated as a football play-by-play announcer as well. As far as hockey announcers went, I liked Gary Thorne’s call. Great pipes and called a solid game. He was getting a lot of great assignments back in the early 1990’s. In regards to today’s broadcasters, I would say that I honestly am not a fan of most NFL play-by-play announcers on radio. I think the sport (on radio) has devolved into an unabashed homer fest. As an East Coast guy, I like my play-by-play to be somewhat unbiased, yet still have an exciting call. The New York guys (Bob Papa w/the Giants and Bob Wischusen w/the Jets) do come as close as you can get. What you hear from some of these other cities is actually pretty hysterical. As far as TV goes, I think Ian Eagle does a splendid job on whatever he calls, but I like his NFL work in particular. With baseball, I am still very much a Mets fan, and I really appreciate the work of their whole crew on SNY (Gary Cohen, Keith Hernandez and Ron Darling), as well as Howie Rose on Mets radio. Since I work primarily in hockey, I have the obligation to listen/watch to as much of it as possible when I’m not calling games, especially since I also freelance for the NHL as well voicing over highlight packages that are broadcast in the arenas during games. Nobody calls a better game than Doc Emrick, and it’s hard to find many who would disagree. Although I am not a Rangers fan, I’m a big Sam Rosen fan, and he does a great job, as does Howie Rose with the Islanders on TV. In terms of hockey broadcasters on radio, I think that John Wiedeman on the Blackhawks radio network. He used to call games for the Islanders, although he left just as I joined the Sound Tigers, so I’ve never had the opportunity to speak with him. He calls a game on radio about as well as you can call one, very descriptive and energetic. There are a lot of very good guys calling games at the NHL level, but there are just as many in the AHL that (in my opinion) are just as good. It’s been great to see a number of AHL announcers move up in the past several years! I try to call my own game. One of the things that I learned from Marty Glickman (and it’s a thought echoed by Vin Scully) is that you have to be yourself. The most unique thing you can bring to the broadcast is YOU. However, I do think about what certain broadcasters do very well and try to ensure that is part of my broadcast, but in my own way. So when I call a hockey game, I want to make sure that I’m covering all of the basics (time, score, description of the play) because those are still the most important things to bring to a broadcast on radio. However, I really like that Doc Emrick is great with varying his vocabulary, and I like that Howie Rose will bring some levity and humor at times to his call (his ability to do this definitely comes from his extensive baseball work), but isn’t a “catch phrase” guy or tries to be overly witty. I was fortunate enough to learn about hockey play-by-play under former St. Louis Blues voice Ken Wilson, who called games for 20 seasons. He was also highly regarded as a baseball announcer, where he worked for a number of teams and called some big moments (including Pete Rose’s record breaking hit). Ken really called a great game, both on radio and TV. He did have one big catch phrase (Ohh Baby) that was shared with John Davidson (who used it frequently when he was an analyst), but he taught me a lot about how to effectively call a game, which was important considering that I was hired to work in the USHL without any hockey experience whatsoever in 2003. I call pretty much a straight up game, without a ton of “bells and whistles”. By that, I try to make the game the experience, and not (as other announcers sometimes do) make it about me. Hockey is a fast-paced, hard-hitting sport, and I use my voice to describe it as such. So yes, I get very excited during my call on a big hit or a fight, or a big save/goal. What I don’t do is quote movies or make up catchphrases that try to show off my pop culture knowledge or wittiness. There are opportunities to bring that part of my personality to the game, but not at the expense of the on-ice action. Outside of sports you’ve worked for some who’s who in terms of broadcasting like Sean Hannity and Curtis Sliwa, how much did you learn from those experiences and what was that like? I worked at WABC for a couple of years, as well as one of the first online broadcasters (talkspot.com) in the late 90’s, and they were both great experiences. I learned important skills like how to be a good show producer as well as how to drive a good talk show. As far as my sports broadcasting goes, working with those guys really didn’t do much in that regard, but in terms of hosting talk programming, I learned a lot into how to grab an audience and hold them. Mostly it was a lot of fun. I once produced a four-hour show for Curtis about White Castle burgers. He would often do off-the-wall topics that were engaging to fans regardless of your political leanings, and that made it fun to listen to. It wasn’t national politics 100% of the time as you see today in the major markets. Even Sean Hannity was different on radio when I was at WABC when compared to his national program. Back then we were on from 11pm – 2am, and he also covered local topics as well as the national ones. There was definitely more time (re: less national sponsors, etc.) and as a result, the programming was definitely more interesting. What I might have learned from these guys (who are both heavy hitters in the talk world, especially Sean) is that it’s very important to be good to the people that you work with, and treat them with respect. Just because someone gains national popularity shouldn’t mean that you still can’t be a nice person. Some people forget about that and let their egos get in the way—and it’s still ok to have a big ego (it’s hard to carry a national show w/o one), but you can still treat others with respect—it’s not mutually exclusive. I also learned how to cover major events. While in Seattle I was a senior producer for the news/politics channel, and I covered Columbine and the whole Bill Clinton/Monicagate scandal. I had never covered that level of breaking news, so it certainly added skills for my overall broadcast toolbox. Well, my favorite single game broadcast experience was a triple-overtime game that the Danbury Trashers won up in Glens Falls against the Adirondack Frostbite during the 2005 Colonial Cup Playoffs. It was an amazing game between two rivals, and the game didn’t end until nearly 2am. Barry Melrose and Steve Levy were co-owners of the Frostbite and both attended the game. They sold beer until they ran out sometime during the 2nd overtime. There was a good crowd and they were lubed up. Made for a fun atmosphere! In terms of something a little different—I called a minor league game once with Joe Pott (the old Sonic Crosstown Clash between the River City Rascals and Gateway Grizzlies) and during one of the games in Sauget, Illinois (was GMC Stadium at the time), we had to deal with the experience of a streaker who jumped onto the field and ran from foul pole to foul pole before finally getting tackled and removed by security. We wouldn’t give the guy the respect of describing what was going on, so we basically talked over the event (basically there’s an idiot causing a disturbance that is delaying the game type of stuff), but we had quite a laugh over it during the commercial breaks. Thank you so much for doing this Phil, it is much appreciated. You’re quite welcome! I always enjoy the opportunity to talk about broadcasting, and I do think it’s important to give back to those who wish to be part of the industry. It’s a great industry and I love calling games. There are certainly quite a few challenges, especially personal ones, which go into doing this for a living, so you really have to take a personal inventory of what you want out of life if this is something you’re going to pursue. I don’t think many younger guys and gals who want to do this really think about the potential personal sacrifice that they’re making by choosing to work as a sports broadcaster—especially those who wish to get rich off of it—because as most of us know, that’s not happening for 99% of us.